In 'Machinic Orality and Virtual Ecology' Guattari looks at performance art. Even though it could be argued that performance art is not conceptual art, nor relational art, Guattari wrote this text at the beginning of the 1990s, before Bourriaud's concept of relational art had been developed. Also, relational art cannot be pinned down in any absolute sense: there are very often performative elements in it, as we can see in the examples Bourriaud gives us, such as Noritoshi Hirakawa placing advertisements asking for people to take part in his shows, and Pierre Huyghe putting out a casting call (Bourriaud 2002: 8). Guattari explains how performance art enables us to pose questions around space and time, language and meaning-making, by offering up new possibilities that help us challenge the notion of the everyday (1995: 90). Bourriaud also makes reference to the everyday when discussing Guattari. He explains how art can catalyse energy and divert it by, in a sense, bouncing it off the subject, which in turn changes subjectivity (2002: 97). In his discussion on performance art, Guattari goes on to say: “But it seems to me that this art doesn't so much involve a return to an originary orality as it does a forward flight into machinations and deterritorialised machinic paths capable of engendering mutant subjectivities.” (1995: 90). Bourriaud makes reference to this when he talks about how the process of subjectivization, in producing a new subject, works in the same way that an artist does when creating a new artform (2002: 88). These “mutant subjectivites” open up a multitude of possible futures that cannot be anticipated in advance. Deleuze's logical approach to words and objects, and the process of understanding them, does not really allow for a multitude of possible universes because of the nature of what 'sense' is. 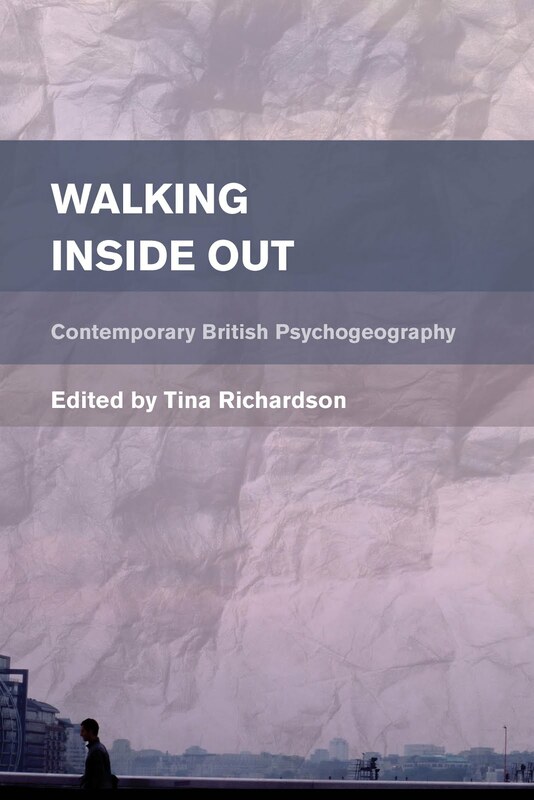 However, the co-work done in the capitalism and schizophrenia series is not totalising at all with discussions on 'lines of flight' which enable new subjectivities. And, What is Philosophy? (1991), another joint project, discusses the plane of immanence, which, put simply, is an infinite space that enables thought to arise. We must remember that Deleuze is a philosopher though. Because of logic's philosophical and metaphysical history, sense is loaded with a particular logos which is embedded in a patriarchal mode of thinking. Deleuze is not challenging logic here, but showing us how it can be used as a tool, so I am not criticising him for taking what might appear as a logocentric stance (and I do not believe he is), merely pointing out his preference for choosing a formal and ordered subject-matter to analyse. Deleuze's preoccupation in The Logic of Sense is with what occurs between words and things, between signification and the objects in the world: “Everything happens at the boundary between things and propositions.” (2004b: 11). This is where the paradoxical element is located and so too where sense is formed. For Deleuze it is a false idea that the answer to the riddle can be found in the depths, one needs to rise to the surface to make sense of the world. We need to slide along the surface of the contradictory series (for example: word/object, signifier/signified, inside/outside), enabling a passage from one side to the other, the other side being simply the opposite direction (Deleuze 2004b: 12). It is the impression given by opposites, and contradictions, that they exist in some eternally alternate domain from each other, and this is the problem posed in the paradox. But for Deleuze there are no contradictions: “The force of the paradoxes is that they are not contradictory; they rather allow us to be present at the genesis of the contradiction.” (Deleuze 2004b: 86). While I do not think that the resolution of a paradox can be absolutely contrasted to the process of chaosmosis, and therefore my choice of example is not a 'neat' one (it is neither final nor conclusive), it does highlight the differences in the two theorists' approach. It is apparent from Deleuze's discussion on the paradox that there are really no contradictions, and where there are they are a function of how language operates. I do not dispute his argument, but rather wish to highlight his style and choice of topic, in contrast to what Bourriaud sees as a preference for Guattari's chaosmotic style. I would now like to look more closely at how Deleuze's process of analysis (for example, how the collapsing of binaries brings about resolutions) could be considered to bring a form of closure and terminate other possibilities. I would like to stress, though, that when Deleuze and Guattari write together, their writing is very oriented around multiplicity and actualising possibilities, especially when discussing “lines of flight”. I shall firstly look at what Bourriaud says about how the traditional aesthetic operates and how he uses Guattari's aesthetic paradigm to critique it. 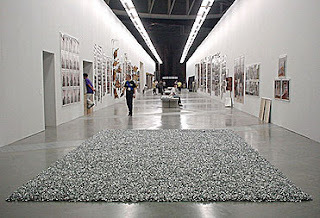 Bourriaud explains the responses by the viewer-participator to relational art: whereas the classical aesthetic involved a “buffer” between the closed-off, separated artwork and the beholder, relational art involves “aesthetic fluidity” which arises because of the relative position the viewer-participator is in relation to the artwork (2002: 100). He says that this aesthetic response, along with the art and the 'viewer', cannot be separated (ibid.). Bourriaud shows how Guattari's aesthetic paradigm effects subjectivity, creating new possibilities: “It's the spellbinding, para-hypnotic process of the aesthetic way of looking that crystallises around it the different ingredients of subjectivity, and redistributes them towards new vanishing points.” (ibid.). Guattari sees these “mutant subjectivities” as providing new voices (polyphony), and from them a new coming-together becomes possible, a world richer in both form and ways of living (1995: 90). He explains that this process of “recomposition” enables “a search for enunciative nuclei which would institute new cleavages between other insides and other outsides and which would offer a different metabolism of past-future where eternity will coexist with the present moment.” (ibid.). To return to The Logic of Sense, I would like to continue where I left off with Deleuze and revisit the paradox to show the formalised, thorough and fiercely analytical (although admirable) formulation and solution to a problem. Deleuze explains how nonsense is internal to sense, emerging out of it. On the surface, Deleuze says, there is a line that enables sense to be produced: “The two series are therefore articulated by their difference, and sense traverses the entire surface, although it remains in its own line.” (2004b: 99). In art these processes that appear as series might involve oppositional terms such as: subject/object, art/beholder or art/artist. The surface simultaneously separates and assures the connection of the series, and the line of sense will eventually be produced there, on this surface, because “this line-frontier would not enact the separation of series at the surface if it did not finally articulate that which it separates.” (Deleuze 2004b: 209). Deleuze's deeply philosophical analysis of the series, and how oppositions or contradictions can actually 'make sense', is an extremely dense and formalised theorisation which neatly takes the reader through his proposed system of sense formation. The reader comes away with a kind of satisfaction which gives them a sense of finality in understanding how contradictions work. However, for Guattari it is the opposite that he is aiming for in terms of the individual's relationship to universality: “Thus the singular points of view on being, with their precariousness, uncertainty and creative aspects take precedence over the fixity of structures so distinctive of universal visions.” (1995: 59). While I do not believe that Deleuze would describe his reconciliation of the series to be a 'universal vision', it is nevertheless the position of cooperation that the reader is placed in, in relation to The Logic of Sense, that makes this move one of finality. As we can see from what Guattari says above, this is not a position that Guattari sees as productive. He goes on to explain that bridges need to be formed between what he calls “actual and virtual functions” (ibid.). In The Three Ecologies (1989), which Bourriaud also refers to in Relational Aesthetics, Guattari speaks of a concept called “transversality” which has the function of forming bridges between territories. Gary Genosko, in an essay which is included in The Three Ecologies, describes transversality as “the tool used to open hitherto closed logics and hierarchies.” (2008: 54). Guattari explains that through these tools “subjectivity is able to install itself simultaneously in the realms of the environment [and] in the major institutional assemblages” (2008: 45). Bourriaud explains how in art this produces the effect of reducing the artist’s significance in the art so that other relationships can become apparent (2002: 93). Postmodern philosophers flit around pragmatic research in vain. They remain loyal to a structuralist conception of speech and language that will never allow them to articulate the subjective facts in the formations of the unconscious, aesthetic and micro-political problematics.” (1996a: 111). Even though I am sure this is in no way a criticism of his friend and collaborator Deleuze, it does describe Deleuze's lineage and his attachment to language. Deleuze is a 'philosopher' and Guattari a practitioner, psychoanalyst and theorist; and as Genosko says, it is difficult to pin him down in terms of categorising him (2002: 29). Guattari is specifically interested in the “ontological texture” (1995: 81) of chaos and how the single individual (who is at the same time the multiple) can be part of the event which, in effect, they are not separate from. This event, for Bourriaud would be the moment that arises from the participation in the artwork, which is never rigid or fixed in time and space, what Guattari calls the “proto-aesthetic paradigm”, which is “perpetually in advance of itself” (1995: 101-102). Guattari explains how art has the power to challenge “transcendental Truth” (1995: 102) which is difficult to do when one is oriented in language, and I mean that in respect of everyone participating in art, especially from a Western perspective, but also if one's heritage is philosophical, and therefore linguistic in nature, as it is for Deleuze. My discussion in this essay has been oriented on finding the reason why Bourriaud has an attraction for Guattari over Deleuze. The work Deleuze and Guattari have done together has made this investigation difficult, this is complicated by the fact that they could both be considered to be 'poststructuralists'. Although Deleuze's historical background was structuralist, in the more philosophical sense of the word, it is also likely that Guattari took a traditional path through training as a psychoanalyst, at least in his early days - even though he studied under Lacan, this is still a Freudian lineage. I have not been able to answer in uncertain terms what it is that forms Bourriaud's preference for Guattari and have had to piece this study together like a work of detection. Rather than looking at just one aspect I have tried to include all the possible main reasons I have discovered. This is as much because they are related to each other, but also because what we are attracted to in someone or something is usually not one simple (single) element but a multitude of qualities that make up that entity: for example the assemblage of what appears as the pronoun Félix Guattari. The largest part of my essay was on the statement that Bourriaud made in direct reference to Guattari and Deleuze, the issue of chaos versus order. While I could have spent the whole essay looking at this aspect, I did not. Just because it was the only direct comparison (and a polar one at that) it may have been too neat and convenient a hook to hang a complete reason on. I also was cognisant of the fact that because Deleuze and Guattari cross-over in a number of their terms and theories - for instance, assemblages, deterritorialisation, becoming - it would be rather too easy to look only at a difference of opposition, such as chaos and order. I did not want to unintentionally place Deleuze and Guattari in opposing camps. This would not only be a mistake, but also problematic in terms of a reading of Bourriaud. For example, Bourriaud likes Deleuze's idea that grass grows outwards from the centre and he applies this to how artists can therefore take up their art practice form where they are already located (2002: 13-14). He even repeats this concept in Postproduction (2007: 17). Althusser, Louis. 2006. 'The Underground Current of the Materialism of the Encounter', The Philosophy of the Encounter, trans. by G. M. Goshgarian (London and New York: Verso) pp. 163-207. Bourriaud, Nicolas. 2007. Postproduction, trans. by Jeanine Herman (New York: Lukas and Sternberg). Deleuze, Gilles. 2004a. Difference and Repetition, trans. by Paul Patton (London and New York: Continuum). Deleuze, Gilles. 2004b. The Logic of Sense, trans. by Mark Lester (London and New York: Continuum). Deleuze, Gilles and Félix Guattari. 2007. A Thousand Plateaus: Capitalism and Schizophrenia, trans. by Brian Massumi (London and New York: Continuum). Genosko, Gary. 2002. Félix Guattari: An Abberrant Introduction (London and New York: Continuum). Guattari, Félix. 1996a. 'The Postmodern Impasse', The Guattari Reader, ed. by Gary Genosko (Oxford: Blackwell Publishers) pp. 109-113. Guattari, Félix. 1996b. 'Toward a New perspective on Identity', The Guattari Reader, ed. by Gary Genosko (Oxford: Blackwell Publishers) pp. 215-217. Guattari, Félix. 2008. The Three Ecologies, trans. by Ian Pinder and Paul Sutton (London and New York: Continuum). Before I turn to what I think might be the main thrust of Bourriaud's predilection for Guattari, I would like to briefly discuss the concept of 'partial objects' because Bourriaud makes direct reference to this concept in relation to Guattari. The work that Deleuze and Guattari did in A Thousand Plateaus and Anti-Oedipus is anti-Lacanian, so little reference is made to 'partial objects' a term coined by Melanie Klein to describe objects that have at one time been connected to the child, for example, the mother's breast, and also the faeces. Jacques Lacan developed this notion further into his own concept, the 'objet petit a', the imaginary part object which can never be totally separated from the body and is a remainder from a time when the child had not become distinguished as an individual: a residual of a prior state, before language took them up as a subject. While Deleuze does not use the term much (it is barely used in his Cinema series of books, and on the occasion it is it is only used in criticism), Guattari is happy to talk about it in Chaosmosis. He demonstrates how the partial object becomes the “partial enunciator” enabling the artist to “detach and deterritorialise a segment of the real”, and offer both sense to the participator, while posing the notion of alterity (1995: 131). Bourriaud offers almost a page to his discussion on the partial object from a Guattarian perspective, the “partial enunciator”, explaining how it becomes a “semiotic segment” which then can work autonomously within art production through such activities as “sampling of pictures and data, recycling now socialised and historicized forms [and the] invention of collective identities” (2002: 100). It is possible that Guattari's lack of rejection of the “partial object” - despite the fact that in the capitalism and schizophrenia series Freudian and neo-Freudian models of self are rejected by the two writers - is because of his psychoanalytical background. What I would now like to look at is what might appear initially as a surface manifestation of style between Guattari and Deleuze, but is also one of content and theory: chaos versus order. Guattari and Deleuze would not be happy with the binary distinctions I have imposed on their work in order to set up a contrast between them, but I am choosing this because it is the only point where Bourriaud makes direct reference to a preference between them, my previous analyses being only perceived differences that have come about through some detective work. I believe it is this chaotic (chaosmotic) aspect that can also be related to his introduction of Althusser's aleatory materialism and philosophy of the encounter, what Bourriaud refers to as “random materialism” (2002: 18). Althusser developed this idea from his study of Machiavelli, Spinoza and Epicurus and lays it out in 'The Underground Current of the Materialism of the Encounter', where he develops Spinoza's and Machiavelli's notion of the void and how it evacuates first causes. This void is full of possibilities because it allows for the potential of emergence. How things emerge is through chance encounters. Althusser has based this part of his theory on Epicurus’ atomism, where atoms move through empty space in parallel trajectories and do not touch. However, Althusser takes this notion of the void and looks at the event which arises from a chance encounter (a swerve of the atom). How he ties this in with Machiavelli is that this event can become a place of leverage, and of power. It is this aspect of Althusser that Bourriaud appears to be attracted to rather than his more rigid and structural ideas of subjectivity, and he makes reference to this when he explains that Guattari's method “consists in bringing to the boil the structures fixed by Lacan, Althusser and Lėvi-Strauss” (2002: 89-90). What Bourriaud is attracted to in Althusser are the elements that converge with Guattari: history has innumerable possible outcomes which are never fixed (there is no telos); subjectivity as ever-changing and being formed through social relations; and events occurring in singular moments that cannot be totally anticipated (chance encounters). On page eighty-seven of Relational Aesthetics, Bourriaud states his preference for Guattari's 'chaos' over Deleuze's 'order': “[Guattari's] phrasing is thoroughly oral, chaotic, 'wild and outrageous' (dėlirant), off-the-cuff and littered with deceptive short-cuts, quite unlike the conceptual order that presides over the writings of accomplice and fellow Gilles Deleuze.” (2002: 87). It is because of this clear statement for a preference for Guattari's 'chaotic' orientation as opposed to Deleuze's more ordered approach that I shall now look at this difference. I will do this by looking at the references that Bourriaud makes to Chaosmosis and contrast this to Deleuze's The Logic of Sense (1969), not because Bourriaud makes any reference to The Logic of Sense in his book, but because of the formalised format of the book and because the book is concerned with making sense out of non-sense (one could say: creating order out of chaos). For Deleuze nonsense is not the opposite of sense but actually gives value to it. Before I further examine Deleuze and Guattari, from a Bourriaudian perspective, I would like to briefly introduce the two books from the perspective of form, before proceeding to a more in-depth analysis of the differences in content and theory. Not least because form and content are oppositions which are challenged in relational art, but also because Bourriaud makes direct reference to the style of articulation in the above quote when commenting on Guattari's mode of approach. The Logic of Sense consists of a thirty-four short chapters on what Deleuze calls “series”. These series are paradoxes which Deleuze examines in order to 'make sense' out of them: he looks at what appear to be nonsensical situations or words (this book is all about language) and demonstrates how sense can be made from them. 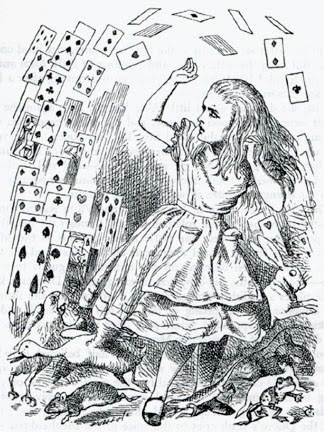 Examples he uses are the portmanteau words of Lewis Carroll, and the thought and speech of the schizophrenic. Deleuze looks at how meaning and meaninglessness converge and at this point sense arises; he provides an extremely elaborate, complex and logical analysis of how this occurs. Each chapter is structured in a very similar way and can almost be read in isolation in relation to their specific subject (chapters are oriented around subjects, for example: paradoxes, games, language and nonsense), although there is a subtle building up of theory as you move through the book. In each chapter Deleuze firstly introduces his own sample and his problem: for example, how the cause/effect duality is really the body/language problem (to eat or to speak, as in Alice in Wonderland). He discusses these issues in the light of other philosophers, such as Plato or one of the Stoics, appearing to go along with their argument in the initial stages but actually using it to challenge them or as a foil to propagate his thesis. He then returns to his own example and either provides an answer (often partial), or offers enough information and enough of a solution, to point the reader towards a direction he will move in in a later chapter. This style is not unique to The Logic of Sense and can also be seen in Difference and Repetition. In Chaosmosis Guattari's chapters, whilst connected in their concentration on subjectivity, could almost be read in any order: it is even the case that two chapters that appear to be related are not together in the book ('Machinic Heterogenesis' and 'Machinic Orality and Virtual Ecology'). The text reads like a 'stream of consciousness'. Guattari's style is rather more one of commentary, and it is possible that the reader may get a sense that there is less space between themselves and the author than there is when reading Deleuze. While it may appear that this could be the opposite situation to one that usually arises when a psychoanalyst writes - clear divisions being set up between analyst and analysand in traditional psychotherapy - this might reflect Guattari's revolutionary approach to therapy: while at La Borde, one of Guattari's challenges to conventional therapy was to break down these classical boundaries. Bourriaud describes Guattari's style as a “scriptorial flow” and he particularly likes how Guattari produces images out of his work by using physical phenomena to promulgate his theory (2002: 86). What I shall now look at his how 'making sense' of something could be argued to be a totalising effect and could be contrary to a notion whereby a work is concerned with the “modelling of possible universes” (Bourriaud 2002: 13); even if this is only a function of approach and style and not a reflection of philosophical orientation. It is important to state that I do not believe that Guattari and Bourriaud negate the idea of 'making sense'. However, there is a finality offered in Deleuze's model of providing a means for making sense, and the resolution provided in that move. I would like to emphasise that I do not see Deleuze's theory as being totalising, rather more his choice of subject-matter and his demonstration of how language operates. For example, here he is discussing the totalising nature of knowledge and how language organises it: “And whatever totalizations knowledge may perform, they remain asymptotic to the virtual totality of langue or language. The signifying series organizes a preliminary totality, whereas the signified series arranges the produced totalities.” (2004b: 58). While I think Deleuze's analytical approach is an extremely valuable tool useful in helping to understand the problems of paradoxes or, what might appear as, gobbledegook, it could be considered to be contrary to Guattari's open-ended orientation. This can be seen in Guattari's chapter in Chaosmosis 'The New Aesthetic Paradigm' where he states: “The metabolism of the infinite, proper to each assemblage, is not fixed once and for all.” (1995: 101). It is also the case that Deleuze's resolution of the paradox is synonymous with his resolution of binary oppositions: in showing how the paradox is resolved he is also revealing how oppositions can be reconciled: which is a kind of deconstructive move. But, the effect of that 'deconstruction' does not open up possibilities but, rather, by bringing confusion to an end also brings with it closure. A definition that ideally applies to the practices of contemporary artists: by creating and staging devices of existence including working methods and ways of being, instead of concrete objects which hitherto bounded the realm of art, they use time as a material. (2002: 103). Nicolas Bourriaud's Relational Aesthetics (1998) is concerned with a particular type of art that emerged predominantly in Europe in the 1990s. Bourriaud coined the term 'Relational Aesthetics' to refer to a response to art which not only emphasised the social nature of the lived experience, but that drew the viewer into the work as participator. One of his definitions is: “art taking as its theoretical horizon the realm of human interactions and its social context, rather than the assertion of an independent and private symbolic space [..]” (Bourriaud 2002: 14). 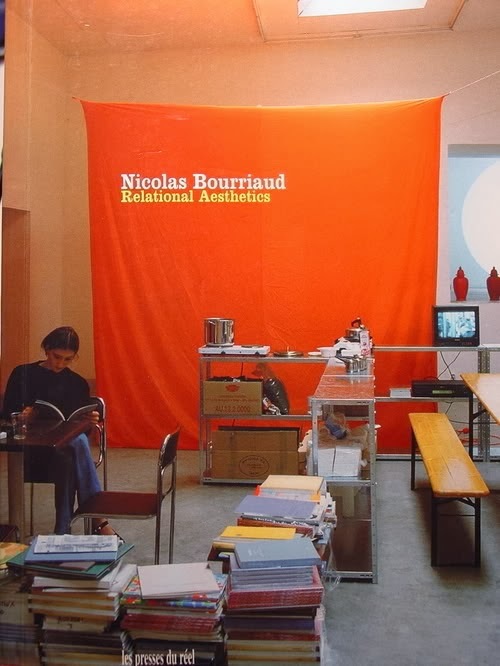 The conceptual artists of this period that interest Bourriaud, are concerned with changing the more traditional position of the gallery visitor as 'beholder' to one of an interactive process. Very often the works Bourriaud discusses do not even take place in a gallery setting but in everyday social space, for example, he mentions the artwork of Gabriel Orozco. In one work he places oranges on the stalls of a deserted market (2002: 17). Bourriaud's intention is to examine what he sees as the misunderstandings of 1990s art (2002: 7); and he does this by discussing a number of artists in the context of a philosophical debate. He often uses theorists who do not traditionally lend themselves specifically to a critique of art but more to an examination of culture: for example, Louis Althusser, Gilles Deleuze and Félix Guattari. While Bourriaud does not see relational art as being specifically a 1990s phenomenon, what makes the art of this period different from its predecessors is its self-conscious aspect: the participator, in their own insertion of themselves into the work, becomes aware of their own social context and place in history. It is apparent that Bourriaud is interested in what relational art does, rather than in a more classical description of what the art is as an object 'out there'. He is concerned with the forming of spaces of interaction whereby an alternative discourse can come into being around the artwork; of new spatial and temporal aspects; and the production of new experiences which move away from “the ideology of mass communication” (Bourriaud 2002: 44). Relational art challenges many of the socially related binary oppositions such as private/public, inside/outside and even theory/practice. It may be this, in part, which attracts him to the non-dialectical approach of Guattari, thus dispensing with the rigidity of dyadically, and triadically, ossified conditions of existence. His concentration on Guattari's work hinges around the book Chaosmosis (1992), and a large part of the latter end of Relational Aesthetics is 'dedicated' to Guattari (while this part of the book appears in as a kind of conclusion, it would actually have been a separate essay in its original form). What I would like to discuss is Bourriaud's particular attraction to Guattari, as opposed to Deleuze. I shall be examining what the possibilities of this privileging might be. Bourriaud rarely states explicitly why he prefers Guattari to Deleuze, but there appear to be a number of threads that could be teased out in an examination of why this might be. What makes this particularly challenging is the large amount of the theory of both Guattari and Deleuze that crosses over, not only in the work they have done together, particularly in their capitalism and schizophrenia series (Anti-Oedipus (1972) and A Thousand Plateaus (1980)), but also separately: for example, the fundamental network-like nature of what they both describe as the “assemblage”, the term they use for a collection of multiple elements that come together momentarily. An assemblage can be anything, what appears as a person, a particular situation, or a mode of thought or action. The elements that make up that 'thing' could be physical aspects of the environment, specific forces or ways of thinking. Assemblages operate on a “plane of consistency” which is not hierarchic in nature (Deleuze and Guattari 2007: 100), they dispense with the privileging which is inherent in binary oppositions. Deleuze and Guattari use the term “assemblage” when they are writing as a pair and as individuals. It is also the case that when Deleuze and Guattari co-write they do not see the existence of a subject per se. For them the subject is not a static entity. There is not even the 'subject of enunciation' offered by theorists such as the linguist Émile Benveniste, wherein at least there is a subject in the moment of speech, however transitory that may be. For Deleuze and Guattari “each individual is an infinite multiplicity” that comes together briefly through movement and rest (2007: 280). The parts that make up the individual are not constant but continually formed, disassembled and re-formed in different combinations; these parts do not belong to the individual, they only temporarily constitute her/him and emanate from the environment of that particular situation (ibid.). At the point a person is considered to be communicating, Deleuze and Guattari describe this as an “assemblage of enunciation” (2007: 89). Where I believe Deleuze and Guattari do diverge to an extent is in the area of the 'individual'. Deleuze clearly states throughout Difference and Repetition (1968) that he does not recognise the individual. Whereas, Guattari's model of aesthetics, in respect to the person experiencing a cultural object, even involves the use of the word 'existential': a term used in humanist-oriented philosophies where the individual's experience of reality, and expression of that, is given priority. The term 'individual' is problematic for Deleuze. For him, what appears as the ‘individual’ is created by a force he calls “individuation” which “involves fields of fluid intensive factors which no more take the form of an I than of a Self.” (2004a: 190). I believe it is likely that the work Guattari has done in Chaosmosis: an ethico-aesthetic paradigm, with its validation of subjects who have the ability to “recompos[e] their existential corporeality” (1995: 7), does lend itself to a more appropriate reading of Bourriaud's theory than does that of Deleuze's at least partial negation of the individual. However, it is important to state that Guattari's individual, or person, is still not a static entity, and he continues to use the term “assemblage of enunciation” when he writing on his own and referring to the 'speaking subject'. It is also the case that in Chaosmosis much of Guattari's focus is on the experiential moment arising from the engagement of the individual, often with their participation in the artwork, and how this process can both affect and effect people. For Guattari, existential singularization is a process of becoming, and when sparked by “poetic existential catalysis” restores an “auto-essentialisation” in the individual (1995: 19-20). It is as if the individual re-connects with a previously alienated part of the self through a breaking down of the boundary between subject (self, ‘in here’) and object (world, ‘out there’). While this does emphasise the 'relational' aspect of relational art it also cannot necessarily be contrasted clearly to the work Deleuze has done in his discussions on cultural 'objects'. Guattari's discussion on art and artists - particularly in the final chapter of Chaosmosis 'An ecosophic object' - while lending itself to a more seamless appropriation by art theory, might be contrasted to Deleuze's concentration on the cinema, which is his preferred cultural process for analysis. However, the singular Deleuze does not totally avoid some of the terms discussed above in relation to the person (individual, subject). So the difference between Deleuze and Guattari when discussing the individual, while it is still an assemblage for both of them - in this example, something that comes together in its relation to the aesthetic - may not be such a contrast. Although it is possible Guattari has a preference for using the term 'individual' in his acknowledgement of the existential aspect of the aesthetic moment (and, perhaps, because of the humanist orientation of his psychoanalytical practice). This may also be the reason he is less constrained in using the word 'subjectivity', even if it is a fluid thing for him. In an interview with Jean-Charles Jambon and Nathalie Magnan, Guattari describes subjectivity as follows: “We do not stand before a subjectivity already given, fitted and packed; rather, we are called to produce it.” (1996b: 215). Altermodern is a term I invented to designate the field of what's next after postmodernism. Actually, it is more of a debate or a negation, and the exhibition is the conclusive process. Altermodern is the cultural answer to what alter-globalisation is, which is a collection, a cluster of singular and local answers to globalisation in the political field - modernity to come - which I believe is existing, is emerging. It won't be continental in the way that it totalises: more of an archipelago of different answers and artists addressing different issues. And, I believe in this form of the cluster, the constellation: points which are connected, one to another, rather than a continental or totalising form. (2009). The term 'altermodern' does not appear in Relational Aesthetics and has been developed since writing that book, but it is likely it has emerged out of the work he did in producing the essays that make up Relational Aesthetics, and it is also possible this may be because of the influence of Guattari, which I think will become apparent as my essay evolves. While my essay will not be concentrating on the terms 'altermodern', or 'alterity', these aspects cannot be neatly separated from both Bourriaud's or Guattari's theorising because, actually, they are crucial to it.